Since the end of February there is a new Grafana plugin for Oracle Cloud Infrastructure available. With this plugin we can access and monitor OCI metrics and data. 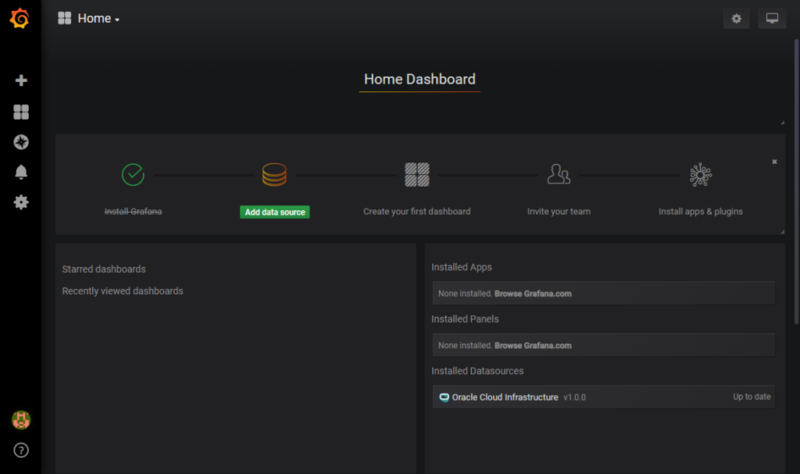 Grafana is an open-source platform for data visualization and monitoring. This blog post shows you how to install and configure the Grafana plugin based on the Oracle blog entry https://blogs.oracle.com/cloudnative/data-source-grafana on an Oracle Enterprise Linux 7 server. 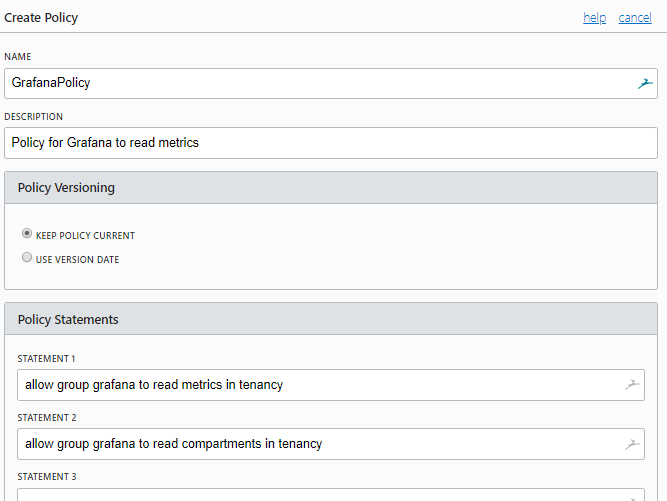 The OCI Grafana Plugin is a nice solution for companies who don’t have a full stack infrastructure monitoring environment up and running like the Enterprise Manager EM13c. But who want to know how their machines in the Oracle Cloud Infrastructure are performing. The server needs access to the internet. In this step, the software will be installed an configured. The new created SSH public key has to be added in the OCI console for further actions. As OS user root we create a new user for OCI actions. Login as user oci, execute the CLI download and installation script. Answer questions with Y / Enter to get the default installation. $ bash -c "$(curl -L https://raw.githubusercontent.com/oracle/oci-cli/master/scripts/install/install.sh)"
After the successful CLI installation, you have to configure it. Based on your OCI account, these information are required – let the config and key location on default values. Test the CLI configuration – example to list all compartments in your tenant. /home/oci/bin/oci iam compartment list --all | grep name "name": "Compartment_Trivadis_BDS_MBg", "name": "ManagedCompartmentForPaaS"
Show the content of the public key to add it in the OCI console to your user which you want to work with. Attention: Three different API keys are the limit! Attention: Be sure that you add the public key to the user which you have used for the CLI configuration! 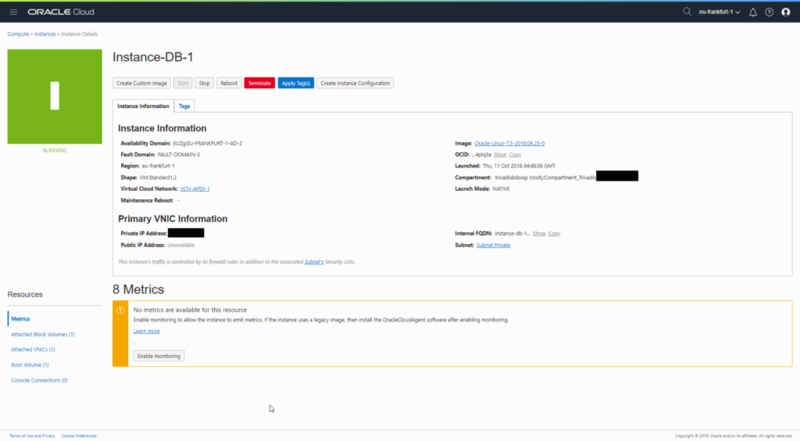 # yum info python-oci-cli Loaded plugins: langpacks, ulninfo Available Packages Name : python-oci-cli Arch : noarch Version : 2.5.3 Release : 1.el7 Size : 670 k Repo : ol7_developer/x86_64 Summary : Oracle Bare Metal Cloud Services CLI client URL : http://pypi.python.org/pypi/oci-cli License : Apache2.0 Description : Python SDK for Oracle Bare Metal Cloud Services command line client utilities. 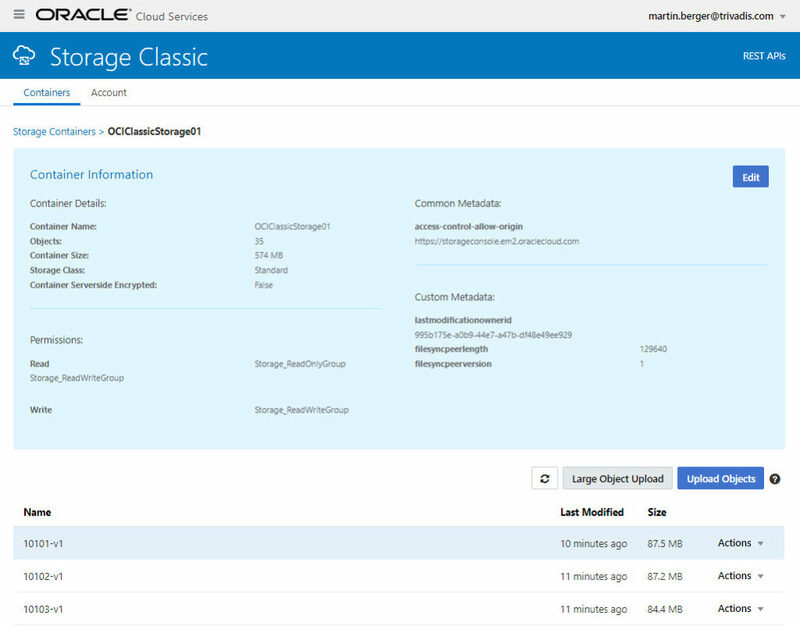 Description : Python SDK for Oracle Bare Metal Cloud Services command line client utilities. A new group is created for a better access control. 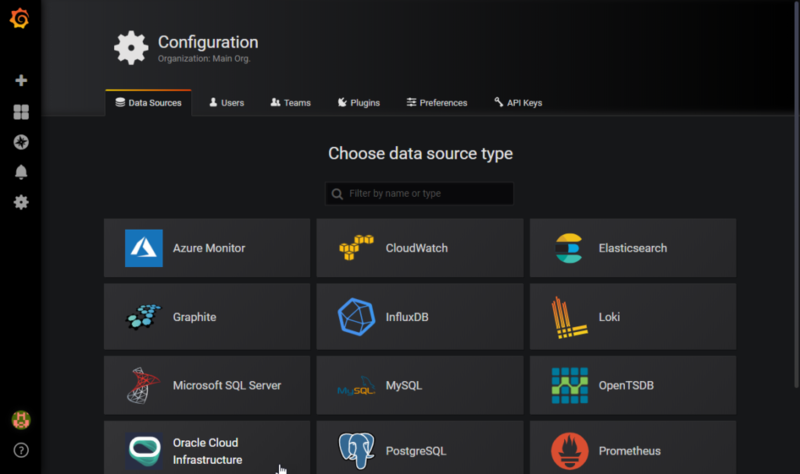 Create a new OCI group called Grafana. OCI > Identity > Groups. Add the selected user to the group – for example this is my user. Create a new policy called GrafanaPolicy. OCI > Identity > Policies with these two statements. Login as user root and install the software. 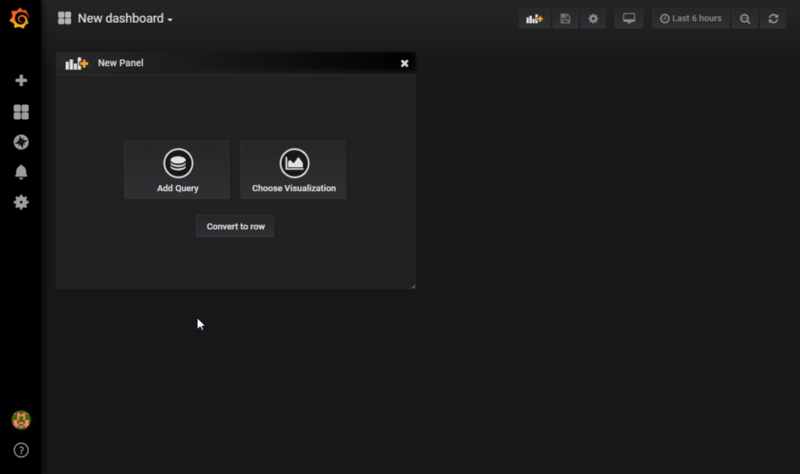 Enable auto start and start the Grafana server manually. Enable port 3000 (Grafana default port in firewall – the port can be changed in /etc/grafana/grafana.ini) to provide web access to Grafana. The Grafana plugin directorya with the installed plugin. drwxr-xr-x. 3 grafana grafana 28 Mar 4 12:26 .
drwxr-xr-x. 4 grafana grafana 50 Mar 4 12:39 ..
Grafana needs the configuration file and the SSH Key from the user oci. As user root, copy the files and modify the permissions. Change the path to the key file in /usr/share/grafana/.oci/config. Login into Grafana with [SERVERNAME]:3000. Username and password are admin/admin. Please change your password after first login. 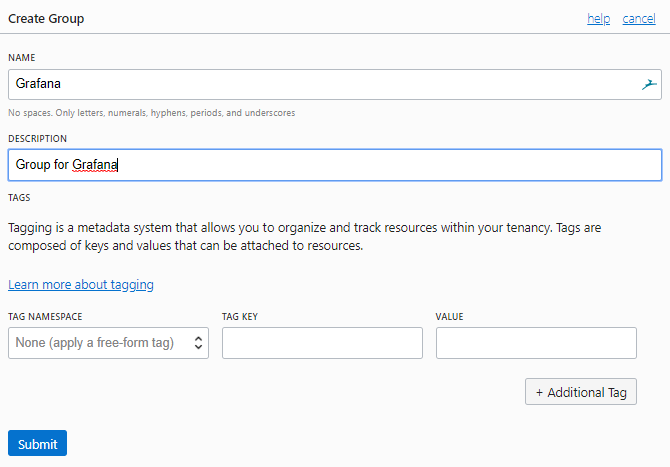 Fill in your tenancy OCI, region and set Environment = Local. Test the connection. 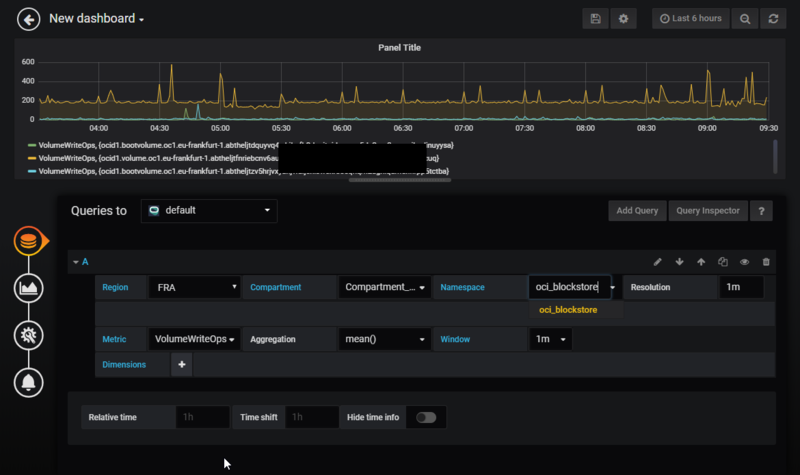 For troubleshooting see Grafana logfile in /var/log/grafana. 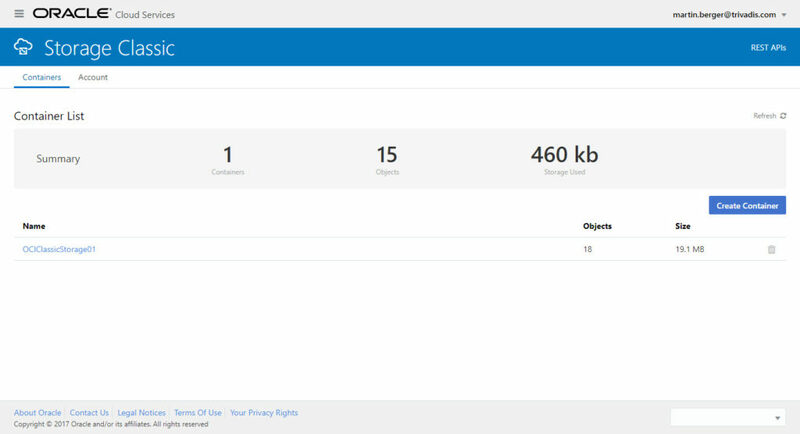 In this dashboard example I used the region FRA, my compartment, the namespace oci_blockstorage and the metric VolumeWriteOps. The OCI Grafana plugin is a nice solution to visualize cloud environments based on Open Source software. 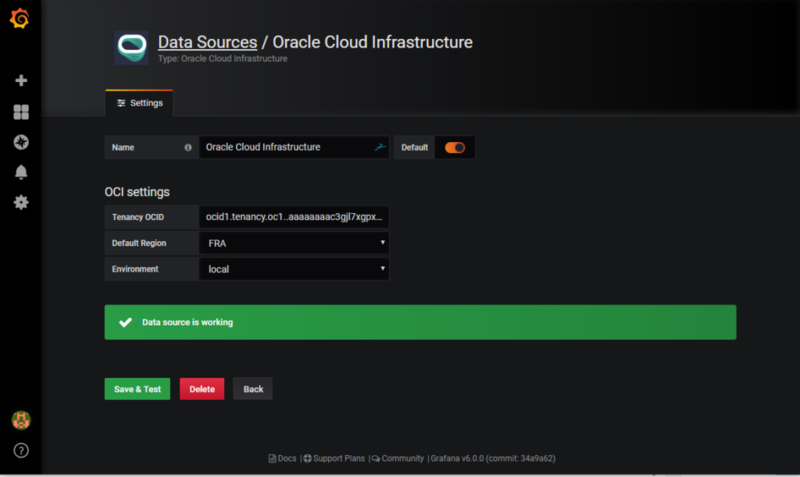 Take care that Grafana needs access to the OCI CLI SSH information for the Oracle Cloud Infrastructure connection. 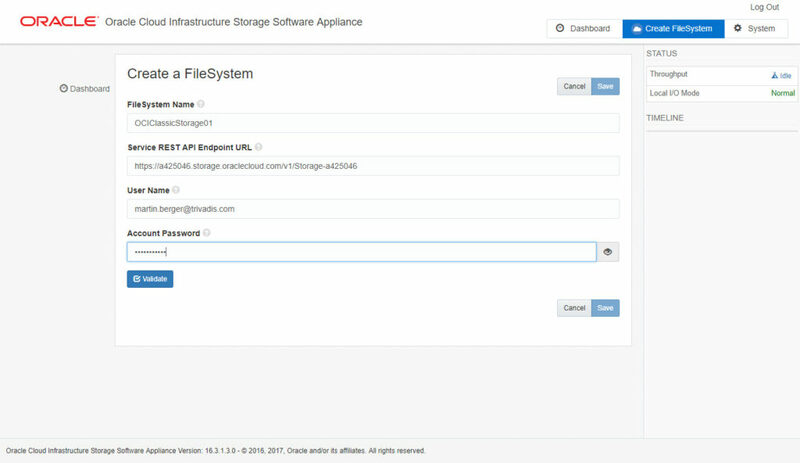 Every day and night, the SSH login by key into my public accessible Oracle Cloud Infrastructure Linux Compute Instance was permitted for hours. And sometimes, when I had luck, it worked. For me it was not clear when it works and when not. But something has blocked me. The password authentification in the OCI Linux instance is basically disabled, the key is the only way to log in. After some investigation on the OCI instance, I found a huge amount of login trials in the /var/log/secure file. These brute force attacks were locking me out! 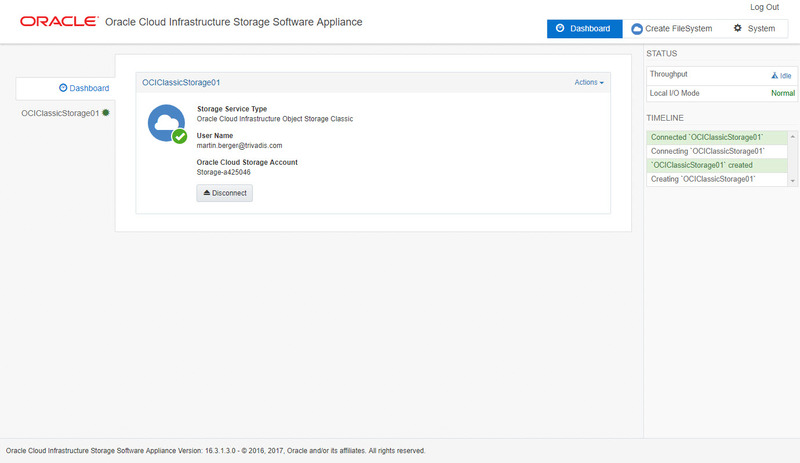 There is a interesting OCI documentation available called Securing Compute with steps how to secure OCI compute cloud instances – and one of this recommendation is: install fail2ban. All steps have to be executed as user root. FYI: I wanted to be informed when a new IP was banned, therefore I have installed sendmail too. For my fail2ban configuration I have created a new file called jail.local and made my settings there. After 2 unsuccesful logins, the source IP will be banned for 86400 seconds. And if a new IP is added to the ban list, I get an email. For OL7 where firewalld is used, verify if the command firewallcmd-ipset is set in /etc/fail2ban/jail.d/00-firewalld.conf. If you use iptables, the command can be changed. Please read the documentation how to change the firewall. Status Check with details, there is already one IP listed. After some minutes, more entries were recognized in the /var/log/secure log file and added. A new rule is automatically added with the match set failban-sshd. After the fail2ban installation, there were other entries left in /var/log/secure. Nov 6 04:50:25 instance-as-1 sshd: Received disconnect from 209.141.51.85 port 38056:11: Bye Bye [preauth] Nov 6 04:50:25 instance-as-1 sshd: Disconnected from 209.141.51.85 port 38056 [preauth] Nov 6 04:50:27 instance-as-1 sshd: reverse mapping checking getaddrinfo for offshore.onion [209.141.51.85] failed - POSSIBLE BREAK-IN ATTEMPT! Nov 6 04:50:27 instance-as-1 sshd: Received disconnect from 209.141.51.85 port 39492:11: Bye Bye [preauth] Nov 6 04:50:27 instance-as-1 sshd: Disconnected from 209.141.51.85 port 39492 [preauth] Nov 6 04:50:28 instance-as-1 sshd: reverse mapping checking getaddrinfo for offshore.onion [209.141.51.85] failed - POSSIBLE BREAK-IN ATTEMPT! Nov 6 04:50:28 instance-as-1 sshd: Received disconnect from 209.141.51.85 port 40808:11: Bye Bye [preauth] Nov 6 04:50:28 instance-as-1 sshd: Disconnected from 209.141.51.85 port 40808 [preauth] Nov 6 04:50:30 instance-as-1 sshd: reverse mapping checking getaddrinfo for offshore.onion [209.141.51.85] failed - POSSIBLE BREAK-IN ATTEMPT! Nov 6 04:50:30 instance-as-1 sshd: Received disconnect from 209.141.51.85 port 42144:11: Bye Bye [preauth] Nov 6 04:50:30 instance-as-1 sshd: Disconnected from 209.141.51.85 port 42144 [preauth] Nov 6 04:50:31 instance-as-1 sshd: reverse mapping checking getaddrinfo for offshore.onion [209.141.51.85] failed - POSSIBLE BREAK-IN ATTEMPT! Nov 6 04:50:27 instance-as-1 sshd: reverse mapping checking getaddrinfo for offshore.onion [209.141.51.85] failed - POSSIBLE BREAK-IN ATTEMPT! Nov 6 04:50:28 instance-as-1 sshd: reverse mapping checking getaddrinfo for offshore.onion [209.141.51.85] failed - POSSIBLE BREAK-IN ATTEMPT! Nov 6 04:50:30 instance-as-1 sshd: reverse mapping checking getaddrinfo for offshore.onion [209.141.51.85] failed - POSSIBLE BREAK-IN ATTEMPT! Nov 6 04:50:31 instance-as-1 sshd: reverse mapping checking getaddrinfo for offshore.onion [209.141.51.85] failed - POSSIBLE BREAK-IN ATTEMPT! After changing the parameter UseDNS to no in /etc/ssdh/sshd_config and a restart, these entries were history. 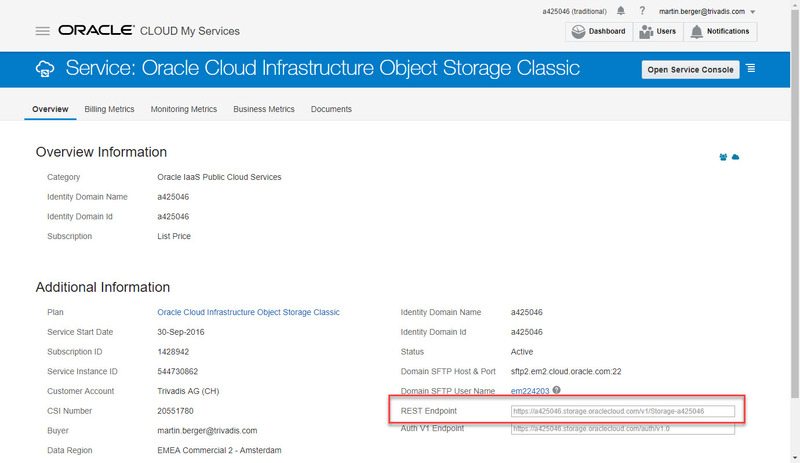 Never let a OCI compute cloud running with a public IP without to monitor login attemps! fail2ban is one step to get more security. 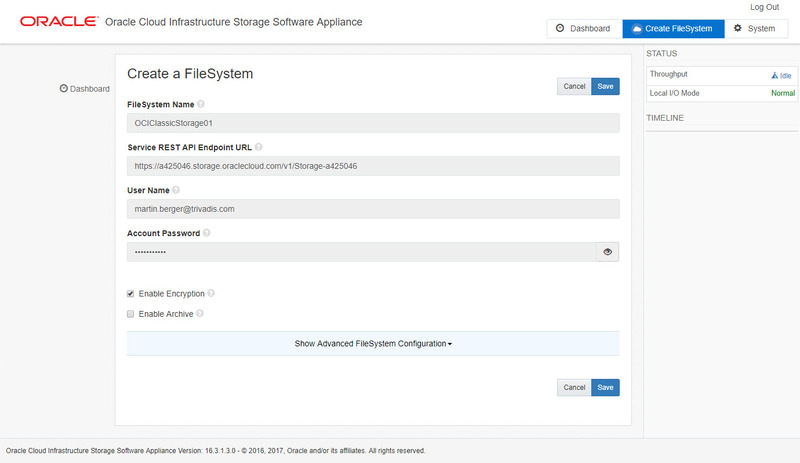 It is easy to configure and it helps a lot. But you have to do the basic work like software updates, SSH key enabling etc. The Oracle documentation is a good base to start! 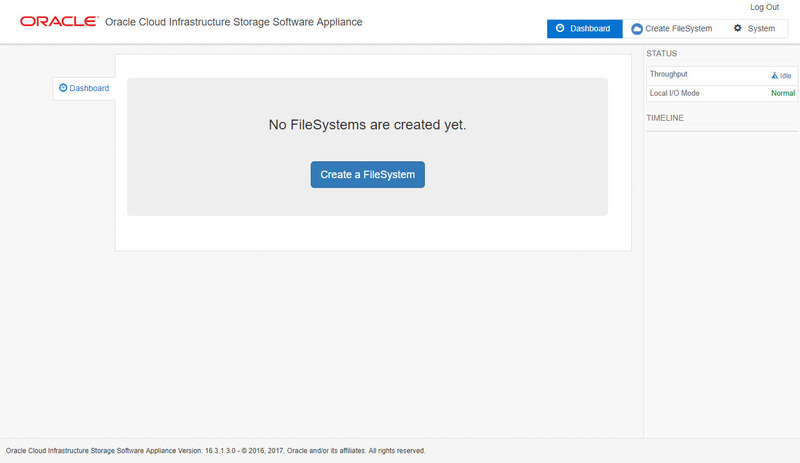 My next step will be to install and configure WAZUH – I keep you up to date!